It all began around mid-February. One Friday evening, I was back home after my day�s work. An e-mail was in my inbox. It was the Presidential Palace. �We are trying to contact you. Call us back�. Of course, I was kind of dubious as I picked up the phone and dialled the number written in the message. Someone answered, and from that moment on, things moved very fast. I simply introduced myself and mentioned the e-mail, but my interlocutor already knew perfectly well who I was. �Yes, of course, you�re the director of Le Monde Du Sumo magazine, aren�t you ?�. He carried on. �So, I�ll explain the situation to you. The President will be on an official visit to Japan from the 25th to the 29th of March, and he wishes you to be a member of the official delegation that will accompany him�. No more time to dream though. We had to keep our eyes wide open, as we were reaching our destination. 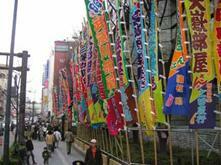 I saw on the left some nobori, those brightly coloured banners carrying the names of wrestlers or stables. All these colors added a touch of gaiety to the grey backdrop! Instead of stopping before the main entrance, our bus went into a nearby street, leading to a discreet backdoor entrance. Then, as we were exiting the bus, I heard a voice behind my back �Oh, look! Those two guys out there! Honestly, aren�t they ashamed to walk along the streets in diapers?�. Ouch! I had almost forgotten this detail: being practically the only one of the group with any knowledge of the world of Sumo, I was going to have a tough time explaining it to the majority of these people and fighting their preconceived ideas! Before I had time to give any information, we reached our seats. Slight disappointment: we were on the north side (just under the TV cameras), on �western� type seats but quite far from the dohyo,. I had no official explanation as to why this choice had been made, but I suppose someone had guessed that it would have been quite difficult for a lot of the delegation members to remain seated on cushions for over two hours. Well, never mind! Just being there was enough to fill me with happiness! The last of the juryo fights were going on, and the spectators were quite surprised by the sudden and massive arrival of our delegation. Fortunately, the wrestlers didn�t even seem to notice and carried on with their preparation. I had barely taken my place when I had to start my �job�: One, two and then ten journalists surrounded me. How did they know me? Puzzling! One of them would explain to me later that they immediately noticed my name on the �VIP guest list� given to them and, above all, they saw my �title�: Director of �Le Monde Du Sumo� magazine. According to him, I was a godsend for them, as they hoped to be able to explain to their readers and listeners the kind of spectacle they were seeing. I just had time to notice that Toki was fighting, when a rumour spread through the audience. A new arrival in the hall. And this time, it was the main character arriving. 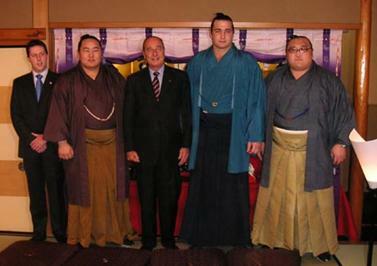 The President and, before him, Kitanoumi richijo, president of the Japan Sumo Association. They both took their places a few seats away from me, and I felt very proud when I noticed that the President was carrying his own Petit Banzuke Illustr�. He watched the fights very carefully with his binoculars, and wrote after each and every fight the name of the winner on the day�s schedule. Now and then, I even saw him dipping into the Petit Banzuke Illustr�, searching for information about the wrestlers. From my place, I couldn�t hear what they were saying, but he and Kitanoumi often seemed to be giving their opinion on the fights. Ultimately, my satisfaction would be at its peak the next morning when I heard that a lot of them, who were initially skeptical of the whole concept of attending a Sumo tournament, were now, with the help of my explanations, deeply interested. But I had known this for a while: with a bit of curiosity and some basic insight, sumo becomes a lot different from the preconceived clich�s that initially spring to mind! Meanwhile, the fights carried on: Takamisakari, who puzzled my neighbours with his stupid show, won his ninth victory; Kokkai got his kachi-kochi; Hakuho neared his; Kotooshu was disappointing, Roho confirmed his shape; Chiyotaikai was dominated by Tochiazuma and lost his eighth fight of the tournament. Then came THE headline fight of this day, if not of the whole tournament. I glanced a few seats on my right, to see that the President, seemingly tense by the stakes of this fight, was keenly observing every move of Kaio and Asashoryu during their preparations. Salt throws, slapping of hands on the mawashi, withering looks, and then it all started. A quick, but beautiful fight. Asashoryu felled the ozeki and won his eleventh title. 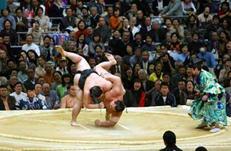 And my neighbour, though she was new to sumo, sighed with relief on seeing that the yokozuna had won. After the �Come on, Come on!� she had yelled throughout the whole of the fight, it was funny as well as touching. But then, just as the bow-twirling dance had finished, it was time to leave. The President stood up and waved to the whole crowd who had turned to him, shouting �Chiraku, Chiraku�. He was to meet a few wrestlers for a very exclusive dinner. There was no time to rifle the souvenirs shops, everyone had to move. This way, to the exit. At that very moment, I felt a hand on my shoulder. �Mr Schuler, will you please follow me, you are going with the President�. Another hesitation. The dream continued. Quite unconsciously, I followed his steps to a minivan that was to leave its passengers at the entrance of a very famous restaurant. The place was magnificent and traditional. I did the same as the other guests, who had taken off their shoes at the entrance, and then went along a long corridor. In one corner, the floor ended, leading into a little area where curved lines, in regular parallels, were drawn in white sand. And, at the end of the corridor, there was a little room. I went in, and was simply astonished when I saw who was in this room: the komusubi Kotooshu and Iwakiyama. They were both huge. That feeling grew when the gigantic Bulgarian stood up. He seemed to fill all the space available in this tiny room. We quickly sat in the nearby dining room. A low table was set in the centre, with cushions around it. Everyone sat in their place, and dinner started. I was on the far right, where all the French were seated, among whom were the President and his wife. On the other side of the table, Iwakiyama sat just opposite me, Kotooshu was at the other end. In the centre, between Kitanoumi richijo and Takasago oyakata, sat the champion of the day, Asashoryu. Being far too impressed to dare uttering a single word, I took some delight in hearing the conversation between the President and the wrestlers. He knew them perfectly, and was asking some very precise questions. For example, he underlined the fact that Asashoryu had won, a few hours ago, a great feat of strength, especially when you thought about the 30 kilogram difference in favor of Kaio. The dinner progressed through twenty or so courses when, without seeing it coming, I realised that the President was speaking highly of Le Monde Du Sumo to those prominent members of the Sumo Association, telling them about the worth of our team and the quality of our articles. I didn�t know how to respond to this best possible advertising, so I just bent myself very low. The whole scene just seemed so unreal! The atmosphere around the table quickly relaxed � as far as it could on such an occasion, of course � jackets were taken off, some jokes cracked. For example, Asashoryu told us that he had indeed been afraid of being hit on his head by a zabuton (cushion) thrown by a spectator after his fight. He mimed it hitting his forehead with his forefinger and pretending to fall backwards. There was a general burst of laughter around the table. A little while later, the President told Kitanoumi how he had been delighted to greet on two occasions the wrestlers in Paris for exhibition tournaments, but also how frightened he had been to offer this kind of �spectacle� to people who weren�t used to it. But both tournaments were such a succes that he ended saying to Kitanoumi that he and his wrestlers would be most welcome again in Paris, whenever they wished to come! Kitanoumi didn�t answer. The last course was served, and I was stunned to see that, whilst it was becoming tough for me to eat at that pace, Iwakiyama, who opposite to me, was swallowing all that was given to him � three times more than my own plates � at an incredible pace, and had no problem in eating some extra bowls of rice. Of course, I knew about the food habits of the rikishi, but seeing them with my own eyes was quite stunning! Then came the gifts ceremony, when Asashoryu took an envelope tied with a thin red ribbon out of his sleeve, and handed it to the President. 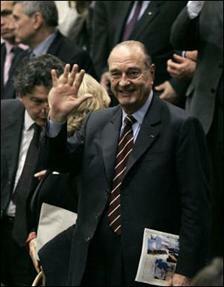 Mr Chirac immediately recognised the prize money given by the sponsors to the yokozuna when he won his fight that day. The President seemed delighted, warmly thanking the young Mongolian. And, while contemplating this gift, he explained to everyone that he had opened a museum, where he displayed all his gifts, and that it had received a lot of visitors. In this museum, you found a whole part dedicated to Japan, and especially a section where he exhibited everything relating to Sumo. And, precisely what Asashoryu had given him was what was missing from his collection! He already owned all kinds of artifacts - a tsuna from Takanohana, a full ceremonial robe of a gyoji, but not a single kensho envelope. This gap was now filled! The evening was about to end, but just before going back to our hotel a photo session was essential, and the President insisted that I be part of it. And indeed, I found myself standing right next to Asashoryu... just look at the size difference! I hadn�t noticed the time passing by. I just thought we had just arrived but it was already time to leave. I respectfully greeted each and every Japanese guest, trying to mumble a mixture of of Japanese (learnt by heart from my �Japanese traveller�s guide�) and English to greet Asashoryu. Everyone retrieved their shoes, and as I climbed into the minivan, I saw the huge, white, chauffeured Rolls Royce in which the yokozuna is driven. That following night, as you can guess, was short on sleep, as I was far too excited by the excellent memories of the day... but such an experience is worth some sleep deprivation, isn�t it?